If you ever find yourself on a night train to Parramatta, you'll notice a burst of bright, colourful commotion just before your stop. That burst is the suburb of Harris Park, where the Indian restaurant-filled Wigram Road has earned the suburb the nickname of Little India. Some 20 restaurants line Wigram Road and the neighbouring neon streets, selling street snacks from converted heritage houses or offering finer dining from gold-painted restaurants. But Harris Park hasn't always been a burst of brightness. "Fifteen years ago when I went there everyone used to tell me that it's really crazy to open something in that dark street," says Ramesh Sharma, owner of Taj Indian Sweets and Restaurant. "After 7pm nobody used to walk on the street. People used to get mugged or beaten up – it was very scary." Moving to Sydney from Delhi in 1995, Ramesh worked almost a decade in marketing and property before his love of food convinced him to open his restaurant in 2003 – one of the first restaurants on Wigram Road. "There were only two shops on this street and since we opened the place really changed. From day one we attracted such a crowd – many, many people from all over Sydney." The crowd was a largely vegetarian one – due to the fact that Taj's menu is (and always has been) 100 per cent meat-free, something few restaurants in western Sydney were at the time. "I've been vegetarian my whole life," Ramesh says. "I am a very healthy man." Even the angriest carnivore will find something they love on Taj's enormous (we're talking 14 pages) menu, which encompasses street foods from all over India. "When we opened we were the only place doing Indian street food – food from the north and south of India," Ramesh says. The best way to try a broad selection of Taj's menu is to order a thali, a platter piled high with curries, rice, breads, papad, pickles and a sweet. 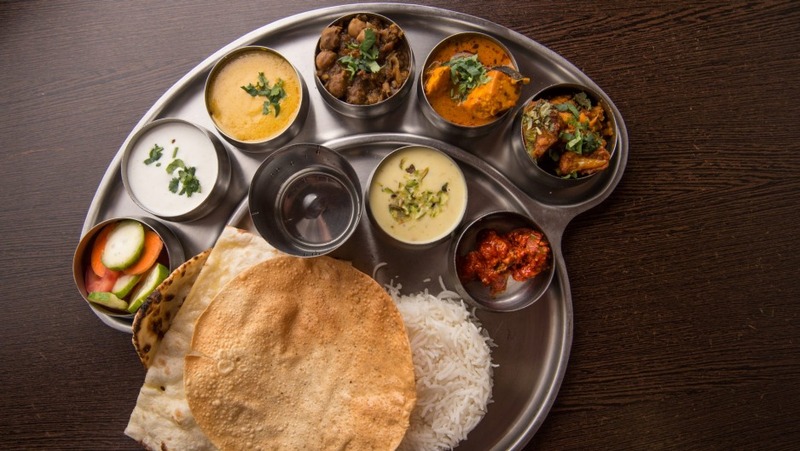 There's a North and South Indian thali – just two of many reasons to revisit. I've been regularly coming to Taj for the past six years and while I have my favourites (I always order the pani puri – crisp, hollow balls filled with chickpeas, potatoes, chutneys and tamarind water), there are entire sections of the menu I haven't explored yet. Plus I've only eaten about 15 of the 100 variations of Indian sweets Taj has on rotation in the five-metre sweets bar, which greets you as you enter. Being spoilt for choice is just part of the Harris Park experience now. 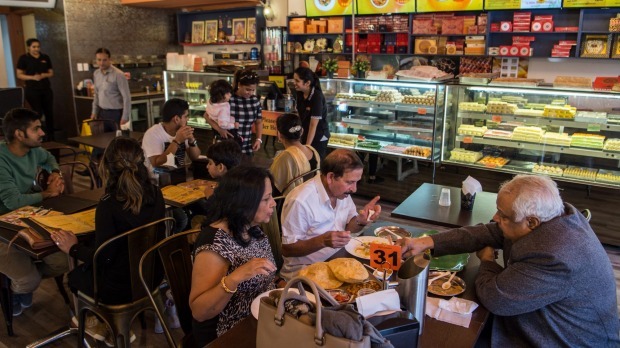 Taj Indian Sweets and Restaurant is a great place to kick off an obsession with Wigram Street, which Ramesh says has changed pretty drastically since 2003. "Now it's the most popular street – another 18, 19 restaurants have come up since we opened but we were the first one." He laughs: "My landlord now sells the properties nobody wanted for two million!" Harris Park's most famous eating spot, Billu's was one of the first Indian restaurants to open on Wigram Street, along with Taj. 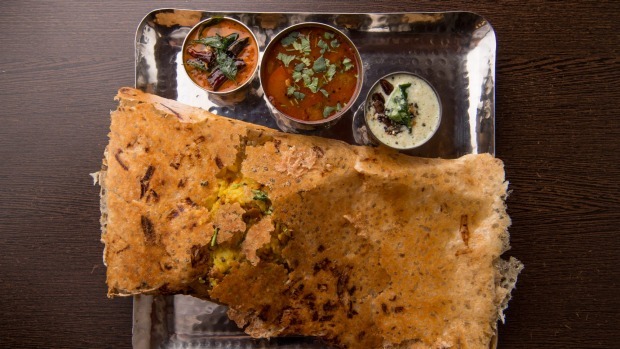 The Chatkazz menu is completely bonkers – classic Indian dishes are served alongside bizarre (and delicious) takes on Western snacks such as club sandwiches and pizza. Need a good all-rounder? 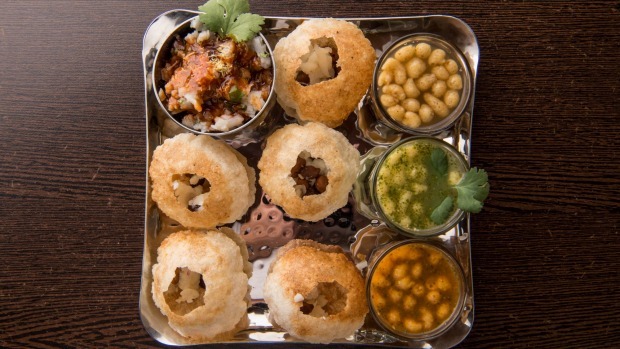 Head to Haveli for a great range of curries, tandoor and sweets.